For the moment, let us consider a simplified solar system that consists of the Sun and two planets. (See Figure 10.1.) Let the Sun be of mass and position vector . Likewise, let the two planets have masses and and position vectors and , respectively. Here, we are assuming that . Finally, let and be the position vector of each planet relative to the Sun. Without loss of generality, we can assume that . Figure 10.1: A simplified model of the solar system. with , and . Here, and are termed disturbing functions. 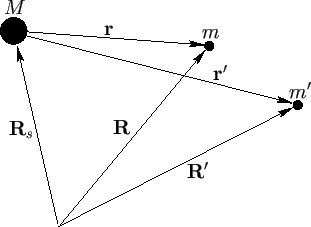 Moreover, and are the gradient operators involving the unprimed and primed coordinates, respectively. where , , , , , are the osculating orbital elements of the second planet. The factors are known as Laplace coefficients (Brouwer and Clemence 1961). In deriving these expressions from Equations (10.6) and (10.8), we have expanded to first order in the ratio of the planetary masses to the solar mass; we have then evaluated the secular terms in the disturbing functions (i.e., the terms that are independent of and ) to second order in the orbital eccentricities and inclinations. The nonsecular terms in the disturbing functions are evaluated to first order in the eccentricities and inclinations. (See Appendix H.) This expansion procedure is reasonable because the planets all have very small masses compared with that of the Sun, and also have relatively small orbital eccentricities and inclinations.